Good sound, bad sound. We don’t want to hear that over-volumed “Thump” of the clipping speaker in the car driving next to us, but we do want to hear when someone is honking their horn. We do want to hear a noise that illicits a reaction. That is what NoiseVision works on. 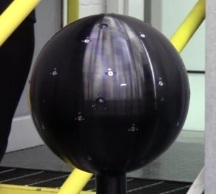 The people at Ford created a sphere that listens for sounds. With 31 microphones and 12 digital cameras. 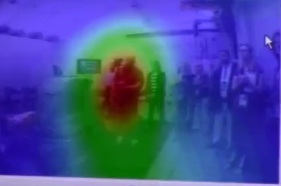 They take the pictures of the sound and overlay a 3D image of the sound. We turned on a metronome to see how the microphones are taking measurements. The cameras will photo the area of the sound. If there is a noise that the engineers cannot get rid of, they can pinpoint it and find ways to mute the sound. It might be by layering or another method. So by doing this, they can get sounds that drivers want to hear. Ford polls listeners to find out what they do want to hear. Then again, there are definitely sounds you need to hear to react. There are some places in New York where you can get a fine for honking your horn. In China, they are high-density driving area. They use the horn all the time. The second part of this video, we learn about how Ford works with bringing certain sounds into the car. They also work on making the sound of your car sound like your car. After all, if you get a Ford Mustang, you want to hear that engine rev.